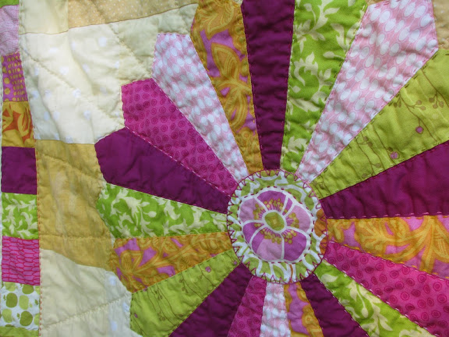 I am so glad to finally be participating in the Blogger's Quilt Festival. I have been so excited to share this quilt. I made this quilt for my daycare provider's new baby girl. I started while she was still pregnant, talked to her best friend to stay in the know on the baby's room colors - yellow, hot pink and lime green, and started pulling from my stash and planning. 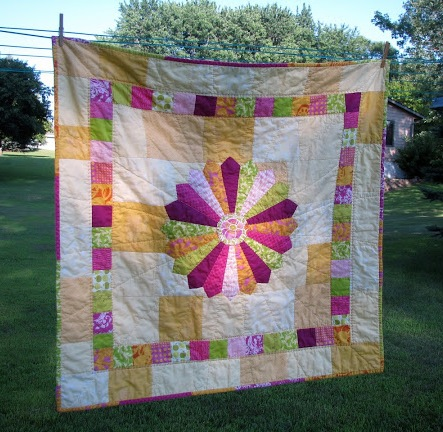 I based the center dresden plate off Anna Maria Horner's Center of Attention Quilt in Handmade Beginnings. I also liked the scrappy background Anna Maria had used in her quilt. I pulled all the pale yellow and gold fabrics I had and figured out measurements to exactly use up all the fabric in each fat quarter of the background fabric. I decided to do the same bright scrappy mix of colors for the inner border, and for the binding. 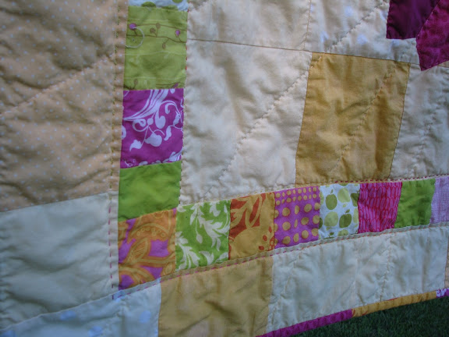 I love the way everything radiates out from the center of the quilt, a perfect spot for admiring a new baby. I hand-appliqued the dresden plate and then hand-quilted the quilt. The hand quilting on the dresden plate took quite a while and was a bit tough to get through all those layers, but it was worth it. This quilt took me months to complete. It traveled with me in the car on road trips and commutes to slowly work on the quilting. 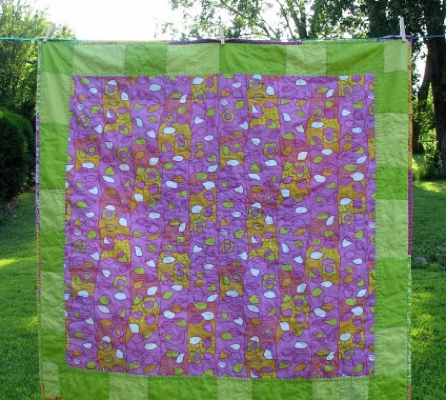 I used a mix of orange, green and pink variegated perle cottons for the quilting of the dresden plate and the inner border to mimic the mix of fabrics. 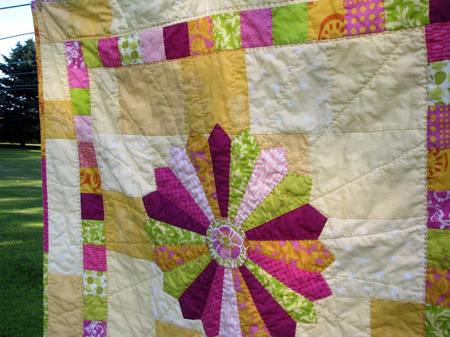 The radiating lines of quilting on the yellow background was done with a cream perle cotton to blend in. I'm also really pleased with how the back of the quilt turned out. I designed it to mimic the front, planning out my quilting in advance to make sure the back would still look good and the quilting would fit the design of both the front and back of the quilt. Lots of memories wrapped up in this quilt. It was a little hard to give away, but it went to one of the sweetest little girls I know. Lovely dresden plate quilt. I also liked the way you used the same fabrics for the border and binding. I'm a car hand quilter, too! Love to see others doing the same. I hope this is treasured as much as I know you treasure it. It is just lovely. Good job! It's darling! I love the multi-tonal background. Amazing, you did a beautiful job!! !